Thanks to our ridiculously simple reservation platform, booking a charter bus in San Antonio is easier than ever. Getting around in a private motorcoach makes travel plans more streamlined and, to be honest, less of a hassle. Our reservation specialists are standing by 24/7 to make sure you get the right bus for the right price. 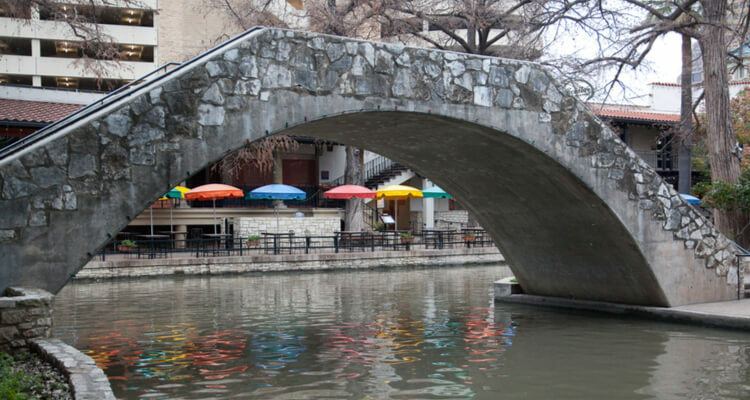 For weddings, corporate events, sports tournaments, and school field trips, it doesn’t get much better than San Antonio. We help hundreds of clients get around town efficiently and safely in clean, reliable charter buses. And with access to buses in over 300 cities nationwide, you’re never far from a city that Shofur directly services. Each bus we charter is equipped with plenty of space to socialize and your choice of complimentary amenities such as WiFi, TV monitors, power outlets, climate-controlled cabins, restrooms, and more. Our team is available 24/7 at 1-800-436-8719 to help you book your upcoming trip. Call us today for a free, personalized quote and a secure bus reservation. 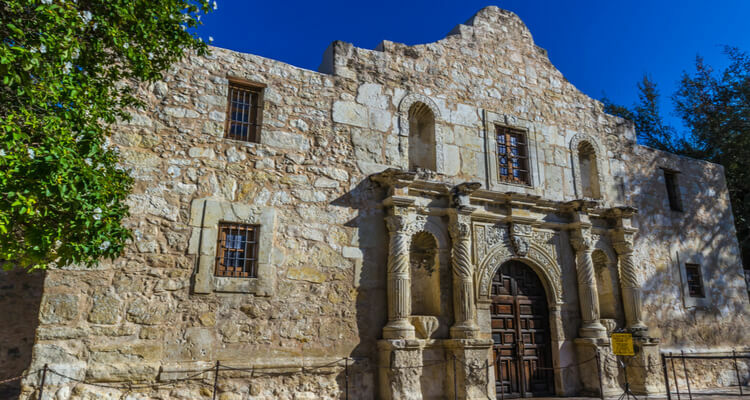 School and community groups across Texas flock to San Antonio to visit sites like the San Antonio Missions to discover the city’s history and culture. We provide hundreds of buses each year for field trips in San Antonio and the surrounding areas, and we ensure that every trip progresses safely and on time. We advise the drivers we work with to arrive at least 15 minutes ahead of schedule to allow everyone time to board the bus. When school administrators request buses with restrooms, they find that they have to stop for bathroom breaks less frequently, which helps their group stay on schedule. High school groups taking college tours around The University of Texas at San Antonio and other nearby colleges can rent a minibus or full-sized coach to get around efficiently. Show an educational film on your bus’s televisions, and bring snacks to enjoy as you ride from campus to campus. A historic collection of buildings including a church, residences, and more for priests and local Native Americans. A state research university with nearly 31,000 students in San Antonio, Texas. 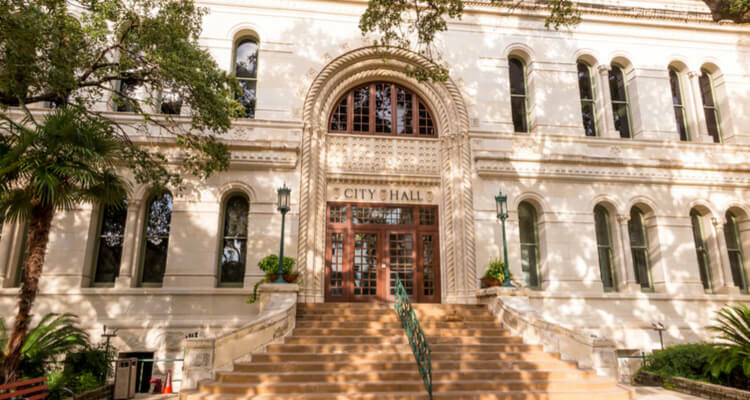 Home of 5,000 years of history and cultures from around the world, the San Antonio Museum of Art is known for its collections of Latin American, Asian, Ancient Mediterranean, and contemporary art. A museum dedicated to telling Texas's stories through science, nature, and culture. Fans and players alike rely on charter buses to travel to sporting events throughout San Antonio. Take a bus to cheer on the Spurs at the AT&T Center, the Longhorns in Austin, the Astros in Houston, or any other team you love to see win! Thanks to cushioned seats and ample legroom, players of any size fit comfortably in the buses we charter. To keep the aisles clear, they can store their equipment, luggage, and personal belongings in overhead bins or undercarriage bays, depending on the bus’s model. For tailgating parties, our customers can store all of their food and supplies securely on the bus while they socialize with friends and family. We’ll take you any distance to make sure you can cheer on your favorite team! From celebrations with family to seminars with coworkers, we’re here to make your travel plans run smoothly. Arrange for a full-sized coach to take out-of-town wedding guests to your hotel and venue, or rent a minibus to bring your wedding party out on the town for a bachelorette party. Your reservation specialist will verify that your bus has everything you need for a great time! Stay on schedule for conferences at venues like the Henry B. Gonzalez Convention Center with a dedicated bus rental. Your coworkers and employees won’t have to take unreliable public transportation or use rideshare apps to get to the event. They can stay productive during the ride to the venue with WiFi and power outlets for electronic devices. Your clean, modern bus will get you where you need to go and will help your team stay on track! We’re here all day, every day to help you book the right bus for the right price. Call us today at 1-800-436-8719 for your free, no-obligation quote and answers to any questions you may have. Our knowledgeable reservation experts are happy to help! No other company could get buses. Called Shofur and they were able to bring buses from Houston to get us in San Antonio. Can we rent a charter bus from San Diego to go to Colorado? How much would this cost? ? Yes you can. A bus from San Diego to Colorado is around $9,284. However pricing is dependent on availability and the number of passengers you may have.